Anyway you slice it, NordVPN vs ExpressVPN is a close match-up. But let’s dig a little deeper and see how they stack up against one another. NordVPN vs ExpressVPN: let’s compare these 2 great VPN providers feature-for-feature. Both are located in countries outside the USA and Europe. Both fully embrace torrent file-sharing and claim they keep zero-logs. Both have grown quickly over the last few years. Both tout lots of servers all around the world. Both support all major devices and operating systems. Both have well-designed apps that are intuitively developed and pretty easy to use. NordVPN makes more use of maps in its apps, but otherwise the two sets of apps work much the same. Both have very generous full money-back guarantee periods of 30 days. ExpressVPN vs NordVPN Wrap-Up: Splitting Hairs? First, let's look right away into some of the biggest differences betwen NordVPN vs ExpressVPN. On a quick glance, the biggest difference between these two VPN services would seem to be the price. NordVPN’s headline price is $2.99 per month while ExpressVPN will set you back $6.67 per month. NordVPN also edges out ExpressVPN when it comes to the number of devices that can be connected at the same time. NordVPN allows 6 whereas ExpressVPN allows only 3 simultaneous connections per account. These are not “every day” features to be sure. For example, both will make your connection slower than if you just used NordVPN “normally”. But these features are pretty cool and only available with NordVPN. Double VPN does just what it says: it doubles up your VPN server connections. This is also known as chaining VPN servers or multihop. It means you connect to the first VPN server, which in turn redirects all the traffic to another VPN server, from where online traffic is sent to the final destination. And vice versa on the return of the data sent back to your device. Your connection literally goes through two different servers in two different locations. At the first server, your public IP address is changed and your traffic encrypted. Your traffic then gets re-encrypted at the second server in a different location. The Double VPN combinations currently offered by NordVPN include US-Canada, UK-Netherlands and Taiwan-Hong Kong. You can always check the latest combinations at NordVPN’s up-to-the-minute server list. NordVPN optimizes these combinations so as to minimize the speed loss that can be expected from the advanced security of multiple server hops and layers of encryption. What’s more, the Double VPN connections are mixed between the UDP and TCP protocols for even more added security and anonymity. All of this means one thing: it intensifies your level of security. When would you use Double VPN? You wouldn’t use this feature just for the heck of it because it does mean slower speeds. But anyone facing a high level of Internet censorship or surveillance would be wise to use Double VPN all the time. This would include journalists, political activists and bloggers working and living in countries with authoritarian governments. Independent tests of this feature, including by the well-respected testing lab AV-TEST, concluded that NordVPN was the only VPN product with a "multihop cascading feature for increased anonymity". As you may already know, Tor (The Onion Router) is a specially configured web browser that routes your web traffic over the Onion Network. It’s Tor, for example, that lets you access the dark web. Tor traffic is encrypted and routed along different nodes (hops). This way, the entry node doesn’t see where your traffic exits, and the exit node doesn’t see where your traffic originated. But the entry and exit nodes will see where your traffic came from and is going to, respectively. Worse, the exit node will see your real IP address when you leave the encrypted safety of the Tor network. 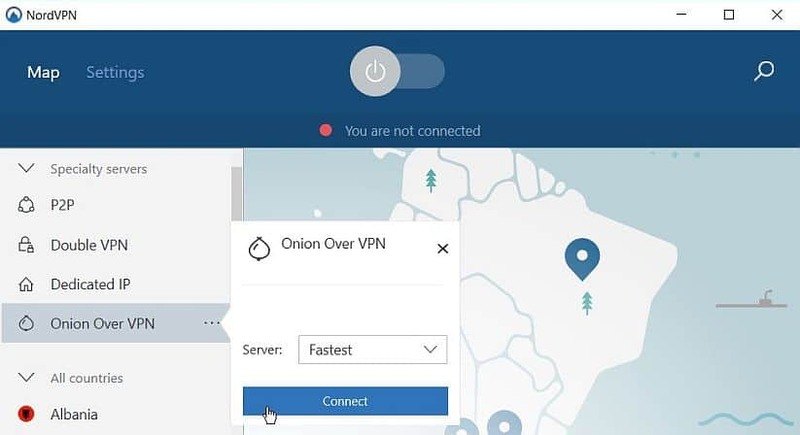 With NordVPN’s Onion over VPN feature, your activities are better camouflaged because it further hides your traffic and real IP address in yet another tunnel of encrypted data while using Tor. In other words, even the entry node won’t know where your traffic originated from and even the exit node won’t know where your traffic exits to or your real IP address. So even in a nightmare scenario where Tor nodes are compromised by government spying agencies, you will still be protected. Plus, if you use Tor without a VPN, your ISP will be able to know you are using Tor. Combined with sophisticated traffic analysis methods, your activities on Tor could be uncovered. Using NordVPN’s Onion Router over Tor feature, protects you from this risk too. And the best part? When you use NordVPN’s Onion Over VPN, you don’t need to download the Onion browser. That’s right. Just connect and surf, including the dark web. Learn more. NordVPNs Onion over VPN feature. Here's a table showing the most important stats of NordVPN vs ExpressVPN. Our comprehensive ‘Compare All VPN Services’ data table is another great and easy way to quickly compare any 2 (or more) of 180+ VPN services side-by-side and feature-by-feature. For the images below, we simply filtered our table for NordVPN and ExpressVPN using the search box at the bottom of the ‘VPN’ column. But ExpressVPN edges out NordVPN when it comes to its number of country locations, having servers in 94 countries compared to only 61 countries for NordVPN. ​However, NordVPN has more servers overall with 5,400 compared to 3,000 servers for ExpressVPN. And NordVPN finishes ahead of ExpressVPN in the areas of price, exclusive features (Double VPN & Onion Router over VPN) and the number of simultaneous connections allowed. Now let’s look in a little more detail at two other factors: zero-logging and speed. Both NordVPN and ExpressVPN are based outside the USA and EU. That’s good news for those seeking privacy and protection from the overreaching surveillance of both of these jurisdictions. Both VPN services also claim to keep no logs. However, to our knowledge, NordVPN’s zero-logging claims have not yet been tested in court or any similar venue. ExpressVPN’s zero-logging claims have been proven when it had a server seized in Turkey, but the server was found not to contain any logs or records of customer activity. A good thing. You can read more about this here. For this reason, we give the nod to ExpressVPN when it comes to customer privacy. It’s not that we don’t trust NordVPN. We do, very much in fact. Plus, it’s not really NordVPN’s fault that they haven’t yet been dragged into court, directly or indirectly, about one of their customers. Nonetheless, with the information available, we have to go with the more proven claims of ExpressVPN as a no-logs VPN service. A less obvious trait to compare between these two VPN services is speed. Speed results will vary and depend on lots of different factors such as where you are located compared to the VPN servers you are connected to, what devices and operating systems you use, and what you use the VPN for (for example, web browsing vs torrenting vs streaming etc.). With that said, it is always best to rely on speed tests performed by independent sources rather than websites with a hidden agenda pushing one VPN over others. The well-respected, independent German testing lab AV-TEST recently put popular VPN services through a number of speeds tests. AV-TEST found NordVPN and ExpressVPN to be virtually the same for overall speed. You can read AV-TEST's entire 29-page report yourself or consult our summary of the report’s performance (including speed) section. An excerpt from the AV-TEST VPN report (emphasis added is ours). At the end of the day, these are two darn good VPN services. They both have legions of customers and for good reason. Choosing either of these VPN services means you don’t have to worry. They both have your back and will keep you safe and private online. But it was kind of fun, wasn’t it? Now make your choice!